Semolina pudding is one of the easiest treats to serve on warmer days! The hard part is to wait at least for 3 hours when your pudding is chilling in the refrigerator. Semolina is such a great ingredient that you can use it both in sweet and savory treats. The traditional dessert with semolina in Turkish cuisine is Semolina Halva, but it’s better to serve it in Winter. When summer days are around the corner and when you start craving for refreshing sweets, a light semolina pudding is absolutely a better choice! You don’t need many ingredients for a classic semolina pudding; milk, sugar and semolina will be enough. Just mix them in a pot and boil until thickens. However, I wanted to make a twist on this simple pudding. I added orange juice and zest to give it a more freshness! You can definitely top it with some pistachio powder or nuts as in most Turkish desserts, but I topped it with chocolate sauce to give it a nicer look. Also, I love the combination of orange and chocolate flavors, they are perfect together! If you are watching your weight and want it lighter, skip the chocolate sauce. It’s still fresh and so delightful! 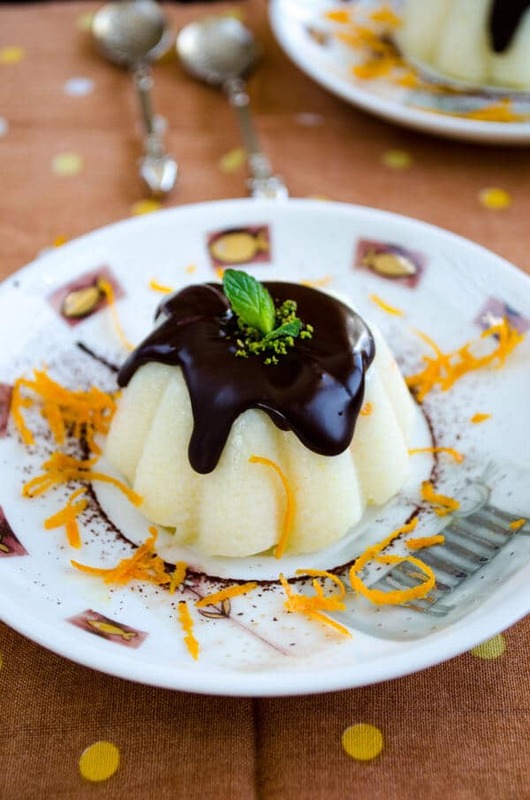 It becomes a super looking Orange Semolina Pudding with Chocolate that can be served to guests on special occasions! You can serve this pudding in small bowls, but I wanted to give them some nice shape. So rather than sharing the pudding in bowls, I chilled it in my muffin molds and serve them upside down. Don’t they look better this way? You just need to wet the molds a little before pouring the pudding into them. It’s better to make this semolina pudding overnight since you don’t wait impatiently and it’s ready when you wake up the next day! A perfect light sweet treat for Summer days! Mix milk, orange juice, semolina and sugar in a pot. Boil it over medium low heat stirring occasionally until thickens. Add 2 tsp orange zest when thickens, stir and take it from stove. Wet muffin molds and pour pudding into them. Wait until they reach room temperature. Chill them in refrigerator at least for 3 hours. Remove them from molds and place on plates upside down. Melt chocolate using the bain marie method. Garnish with orange zest and fresh mint leaves. Note: If you want, you can use a regular cake mold to chill the pudding and serve it in slices too. How gorgeous is this! I must agree, it would be perfect for a warm day. And yes, I would have a very hard time waiting those three hours! Thank you for sharing yet another beautiful recipe!